A Baptist Chapel was founded here in 1838 through the efforts of John Griffiths, Blaenwenen Farm, who secured a 999 year lease from Thomas Lloyd of Coedmore, Llechryd, of a piece of ground for a chapel and cemetery. John Griffiths, 86, had the chapel erected at his own expense and it opened on August 23rd 1838. He also had a house built for himself next to it. He had formerly been a faithful Deacon at Penparc Baptist Chapel. Later that year three Deacons were elected – David Evans, Enoch Johnson and William Griffiths – a son of John Griffiths. The first Minister was Rev. Timothy Thomas, Minister of Graig Chapel, Newcastle Emlyn. John Griffiths died in 1840 and was the first to be buried in the new burial ground, on 14th March 1840. In 1843 the chapel attained membership of the Gymanfa, and the following trustees were elected – Rev. Timothy Thomas, Minister; David Evans; William Griffiths and Enoch Johnson. About 1845 Rev. Timothy Thomas ceased to be the Minister and the chapel was under the charge of the Minister of Cilfowyr Baptist Chapel until 1852. In 1851 David Griffith of Blaenwenen Farm was a Deacon of the Baptist chapel, and there were 60 attendees on average each Sunday. In 1852 Rev. William Roberts of Penyparc Baptist Chapel, Llangoedmor, and Siloam Baptist Chapel, Ferwig, became the Minister. In 1860 Rev. William Roberts ceased to be the Minister here. Rev. Nathaniel Miles, 85, the long-serving Minister of Cilfowyr Baptist Chapel, became the new Minister that year. In 1862 there were 69 members, 44 scholars, and 3 baptisms took place. In 1865 Rev. Nathaniel Miles died aged 90 and was buried here on 6th July 1865. 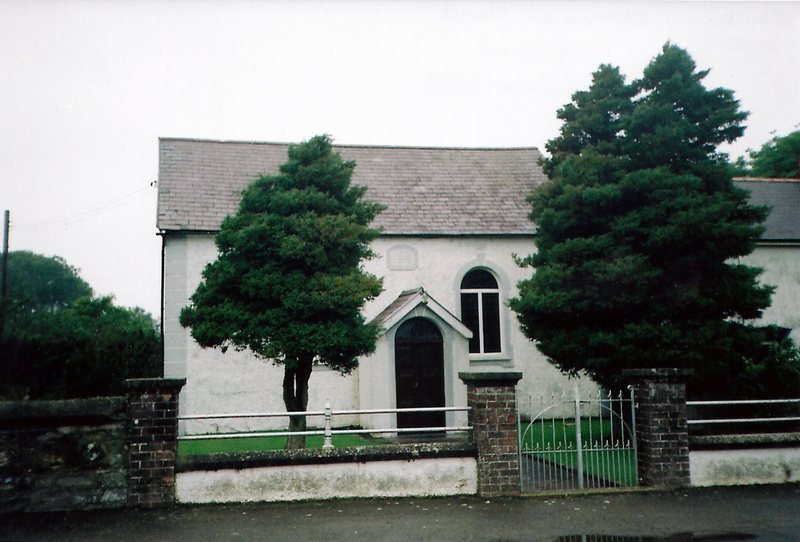 The chapel then came under the management of Bethania Baptist Chapel, Cardigan; Penyparc Baptist Chapel, Llangoedmor; and Siloam Baptist Chapel, Ferwig, until 1897. In 1865 there were 59 members and 40 scholars. There were no baptisms here that year. In 1868 there were 11 baptisms here. There was no Minister here in 1875. A surprise religious census in 1884 showed 90 members attending in the afternoon and 38 in the evening. An Eisteddfod was held here on 3rd March 1893. In September 1896 Rev. John Price (b. 1868 in Dowlais) became the Minister of the chapel until 1951. 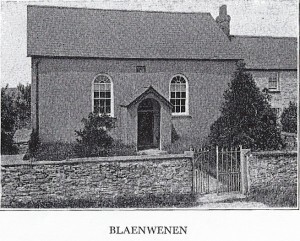 In 1897 the chapels of Blaenwenen and Siloam Baptist Chapel, Ferwig were united under the Pastorate of Rev. John Price. The Deacons at that time were Griffith Evans, Blaenwenen; William Phillips, Cryngae Newydd and John Thomas, Parctwad Cottage. A benefit concert for the chapel was held at Penyparc Baptist Chapel, Llangoedmor, on 28th March 1902. On 15th June 1911, as the original trustees had all died, new trustees were appointed: namely David Davies, Wernynad; Owen Davies, Wernynad; Philip Jones, Pantinker: John Henry Lloyd, Ffos Teilwr; Griffith Owen Evans, Rhos; John Williams, Maengwyn; John Phillips, Cryngae Newydd; Gwilym James, Parxtwad; Daniel Thomas, Stradmore; John Thomas, Tyrlan; Evan Thomas & David Lewis Thomas, Pantirion. In 1911 land was acquired by Griffith Evans, Blaenwenen, from the Lloyd family of Coedmore, Llechryd, to extend the cemetery and build a vestry at a cost of £12. In 1913 the new cemetery was enclosed. On 9th September 1923, to mark 25 years of Rev. John Price’s Ministry, Mrs. E. James of Parctwad donated a new pulpit Bible. In May 1927 tenders were sought for building a vestry. 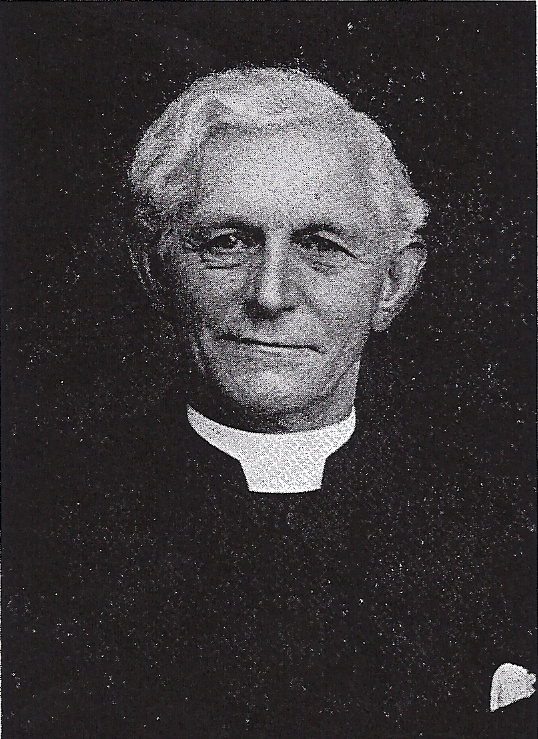 In 1928 Rev. John Price was an officer of the Carmarthen and Ceredigion Cymanfa held in Rhydwilym on 13th & 14th June 1928. In 1928 a new vestry was completed and was opened on 20th June 1928 by Mrs. H. Price, wife of the Pastor. She was presented with a silver key by Mr. Gwilym James. In March 1936 James B. Davies of the Chapel House died aged 64. On 5th/6th July 1938 the newly-refurbished chapel celebrated its centenary. The refurbishment and repairs were conducted by Morgan & Davies of Cardigan. The Deacons that year were: John Phillips, Cryngae Newydd; Evan James, Maeshyfryd; Thomas Evans, Brynsiriol; Daniel Jones, Penllwyndu; John Williams, Penlan (secretary); Gwilym Jones, Parctwad (treasurer); Thomas Williams, Penffynnon; and J Parry Davies, Wernynad. In 1941 the chapel was licensed to solemnise marriages, and the first was Miss Madge Griffiths, Y Ffynnon. In October 1946 Rev. John Price celebrated 50 years as the Minister. In November 1951 Rev. John Price retired as Pastor of the chapel after 55 years. He preached his last sermon here on 30th December 1951. He died on 21st May 1952. On 6th January 1953 the three surviving trustees elected eight others, namely: Donald Gwilym Williams, Amora; Aeron Jones, Elfed Villa; David Byron Thomas, Riverside; Benjamin James Reed, Brynllan; Aneurin Rees, Penwalk; Arthur Cemais Griffiths, Rhosfawr; Joan Laura Griffiths, Rhosfawr; and Edith Blodwen Morris, Ffosyteilwr. On 6th October 1953 Rev. G. Maxwell Evans, formerly of Cardiff College, became the Minister of Blaenwenen and Siloam Baptist Chapel, Ferwig. On 17th October 1954 Maisie Stidder, Idwal Jones and Eric Reed were baptised here. On 16th September 1956 Morfydd Davies was baptised here. In 1957 Rev. G. Maxwell Evans ceased to be the Minister. In 1960 electric lights were installed by Mr. G. R. John of Cenarth at a cost of £128. 12s. On 12th October 1962 John George and Martin George, Ffynnon, were the last to be baptised here, by Rev. E. J. Williams of Newport, Pembrokeshire. On 23rd October 1963 Rev. William Owen Williams of Kidwelly became the Minister of Siloam Baptist Chapel, Ferwig, and Blaenwenen. On 7th June 1967 the chapel re-opened following redecoration. In 1969 Rev. W. O. Williams was an Officer of the Carmarthenshire and Ceredigion Baptist Cymanfa held at Cardigan. In 1969 Deacon Aron Jones died. There were then about 33 members. On 18th June 1972 Rev. William Owen Williams, Minister of Blaenwenen Chapel, died, aged 69. 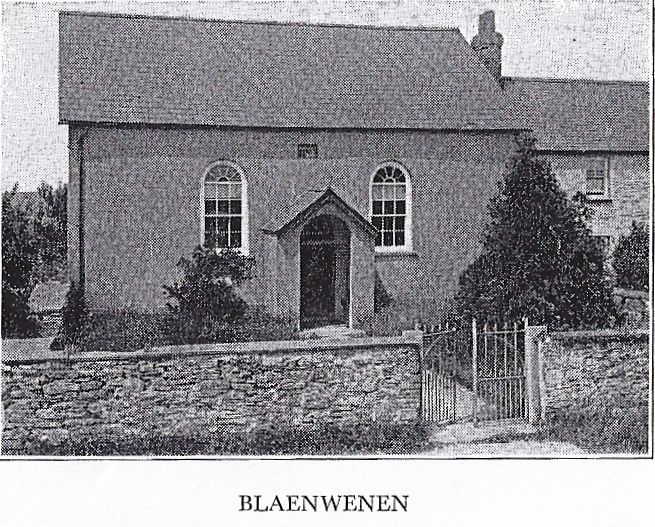 On 5th September 1973 Blaenwenen Chapel was united with Penparc and Siloam chapels, under the ministry of Rev. Idris Hughes. He left in December 1974 for Pontardulais. In June 1976 Rev. George Elias became the Minister until 14th May 1982. In 1982 the vestry was repainted at a cost of £282. In 1983 there were about 30 members. On 21st July 1985 the following Trustees were elected: Mary Ellen Griffiths, Penlan, Secretary; Enoch Martin George, Ffynnon, treasurer; John Bowen Harries, Preswylfa; Eleanor Beatrice Davies, Hirwenfa; Mary Lenora Harries, Berthaur; plus existing Trustees: Donald Williams; Arthur Griffiths; David Donald Reed; and Edith Blodwen Morris. In 1988 there were 19 members. On 11th September 1988 the chapel celebrated 150 years. The Deacons that year were: D. L. George, Ffynnon; Donald Williams, Amora; Martin George, Ffynnon, Treasurer; Mary Griffiths, Penlan, Secretary; Ben Jones, Aberporth; Arthur Griffiths, Rhosfawr; and J. B. Harries, Preswylfa. In July 1989 the chapel linked with Bethania, Cardigan and Siloam, Ferwig, under the pastoral care of Rev. Milton Jenkins. There were then about 17 members. In 1995 Deacon E. Lloyd George died. In October 1995 Rev. Milton Jenkins ceased to be the minister. In 1995-97 there were about 11 members. That year Rev. Meurig Thomas was acting as unofficial minister. Morfydd Davies was the Secretary and Martin George was the Treasurer. 1838 small Baptist chapel, refurbished 1938, roughcast long wall façade with raised quoins to angles and slate gabled roof. Frontage has roughcast central porch with raised stucco door surround, semi-circular arched head with small keystone. Slate roof with plain bargeboard. To either side of porch is tall window with semi-circular arched head, stone sills, raised stucco surround and raised keystone. Bipartite windows beneath lunettes. Plaque to centre, over porch with similar surround, canted head, denoting building and renovations. I thought the chapel was Grade 11 listed? PS No news of Babell Chapel Cilgerran though I understand it has been sold ! !